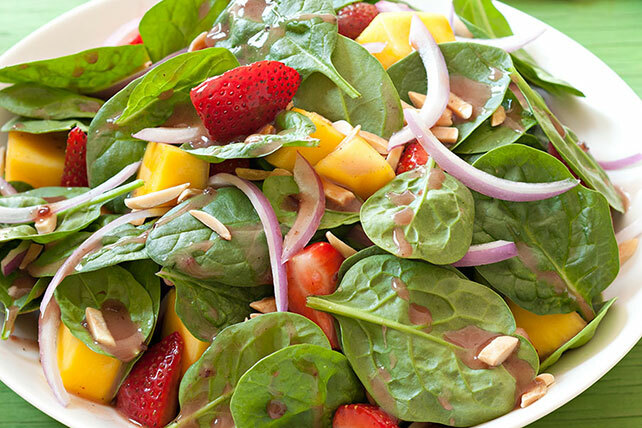 Toss spinach with strawberries and mangos to make a Berry, Mango and Spinach Salad in 10 minutes. You'll love this Healthy Living mango and spinach salad! Cover platter with spinach; top with fruit and onions. Drizzle with dressing just before serving. Toasting nuts adds crunch and intensifies their flavor. There are several ways to toast nuts. To toast nuts in the oven, spread nuts in single layer in shallow baking pan. Bake at 350°F for 10 to 15 min. or until golden brown, stirring occasionally. To toast nuts on the stovetop, place nuts in ungreased skillet. Cook over medium heat until golden brown, stirring frequently. To toast nuts in the microwave, place up to 1 cup of nuts in a microwaveable shallow dish. Microwave on HIGH until fragrant and crisp, stirring every 30 sec.